Olga Nikolaevna Tsuberbiller was born in Moscow in 1885. Her father worked for the Chinese Eastern Railway, while her mother kept the farm and raised Olga and her older brother. Olga Nikolaevna graduated from the Physics and Mathematics Department of Moscow University for Women in 1908, and soon after she began to lecture on analytical geometry. She was as professor and head of the Department of Higher Mathematics in the Department of Chemistry as well as head of the Engineering Mechanics Department at Moscow State University of Fine Chemical Technology (МИТХТ). Olga Nikolaevna was a dedicated educator. At the University for Women, she organized a math library and reading room, in an effort to help students understand scientific literature. She spent many hours counseling and tutoring students, guiding student groups, and advising undergraduate and graduate students. As a gifted speaker, Olga worked to popularize the mathematical sciences. She published a number of books and scientific papers that played a significant role in the preparation, education and development of engineers, scientists, students and academic researchers. One of her books, Problems and Exercises in Analytic Geometry, was published more than thirty-five times in Russian and translated into Czech, Polish, German and Chinese. 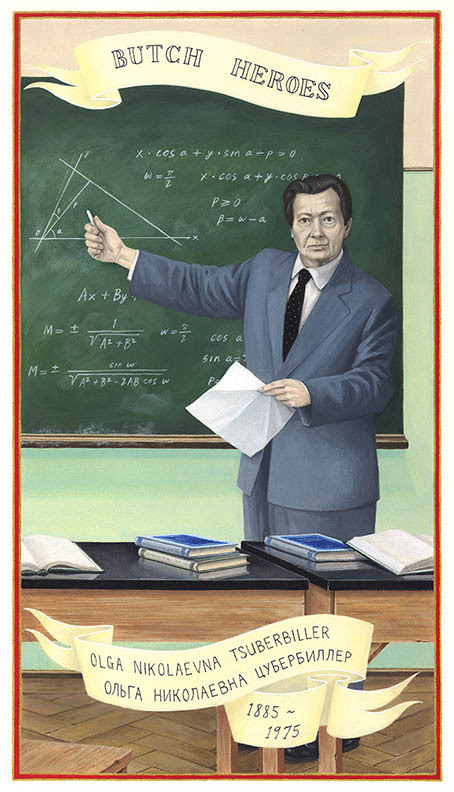 It became the standard math textbook in Soviet high schools and is still used by students in mathematics and technical institutes. Olga Nikolaevna was described by her friends and family as “even-tempered, serious, and good-hearted,” and “overflowing with joy and self confidence.” She could subtly and tactfully guide a conversation and she worked “like an ox” to support those she loved, which included not only her mother, but also her older brother’s two children and, at times, her companion, Sophia Parnok. Olga Nikolaevna met the poet Sophia Parnok in 1923. Openly lesbian, Parnok wrote about her sexuality, love affairs and lesbian experience. Olga Nikolaevna provided stability for Parnok both emotionally and financially. They lived together for nearly ten years. Parnok believed Olga to be her “angel” sent to protect her. When Parnok died in 1933, Olga Nikolaevna took responsibility for her manuscripts and memoirs. After Parnok’s death, Olga Nikolaevna met the writer, teacher, spiritualist and opera singer Concordia “Cora” Antarova. Cora and Olga Nikolaevna lived through the Second World War together, during which time Cora was constantly under surveillance for her writing related to spirituality. In Cora’s later years, Olga Nikolaevna again filled the role of caretaker and protector until Cora died in 1959. In 1969, after almost sixty years at МИТХТ, Olga Nikolaevna retired. She died on September 28, 1975 at the age of ninety and was buried in the Novodevichy Cemetery in Moscow next to Cora Antarova. Burgin, Diana Lewis. Sophia Parnok: The Life and Work of Russia’s Sappho. New York: New York University Press, 1994. Healey, Dan. Homosexual Desire in Revolutionary Russia: The Regulation of Sexual and Gender Dissent. Chicago: University of Chicago Press, 2001. Тоотс, H. A. Беседы Учителя. Как прожить свой серый день. Книга I. 65-72. Moscow, 2010. Шерстобитова, К.Б. “НЕИЗВЕСТНОЕ ОБ ИЗВЕСТНОЙ.” Fine Chemical Technologies (Vestnik MITHT) Anniversary Issue (2010): 37-43.